When George Auckland an Englishman, set up the first jute spinning mill on banks of river Hooghly, West Bengal in1855, little did he realise that he had planted the first seeds of a giant Indian industry. Since than, Indian jute has come a long way. The going has been tough, but today the industry can boast of a wide range of jute products available and are in huge demand in both the markets in India and abroad. The invention of new end-uses along with the preference for eco-friendly and bio-degradable products the world over has been an important factor for the increasing demand for the jute products. Jute is a vegetable based fibre plant, next in importance to cotton. Jute - the 'Golden Fibre' - is one of the most versatile fibres gifted to man by nature that finds various uses in the form of Handicrafts. In the trade, there are usually two names of jute - White and Tossa. Corchorus capsularis is called White Jute and Corchorus olitorius is called Tossa Jute. In India and Bangladesh, Roselle is usually called Mesta. Jute fibres are finer and stronger than Mesta and are, therefore, better in quality. Jute merges with the soil after sustained use. In turn, it enriches the soil with organic substance and helps to grow better crops. On combustion, its fumes are non-toxic and produce no residue. Depending on demand, price and climate, the annual production of jute and allied fibres in the world remains around 3 million tonnes. 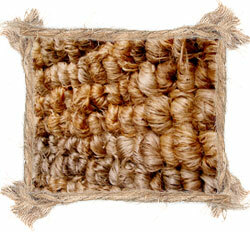 Jute is 100% bio-degaradable and thus, environment-friendly. It is used extensively in manufacturing different types of packaging material for agricultural and industrial products. 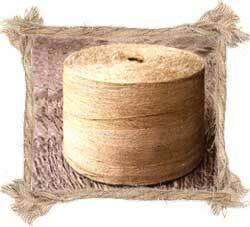 Jute is available in abundance in India, at competitive prices. Jute is now not just a major textile fibre, but is also a raw material for non-textile products, which help to protect the environment, which is an integral part of any development planning. Jute, characterized by its silky texture, high tensile strength and resistance to heat and fire is considered fit for use in industries as varied as fashion, travel and luggage, furnishings, carpets and floor coverings, decoratives, textiles and made-ups. JRP (Jute Reinforced Plastic) is widely used to pack tea and fruits, especially for its excellent 'breathing properties'. It effectively packs garments, cement, fertilizers and other products as well. Jute has also proved to be the ideal replacement of wood. The Indian jute sector, comprising the organized jute industry and a large number of decentralized/cottage units, has now reached the stage of producing materials, which are not only durable, but also attractive from the aesthetic sense.